The Original Racing Carb Spacer! The first Super Suckers were hand-crafted by Joe Petelle for use in Winston Cup before NASCAR outlawed them as an unfair advantage. Over the years, Joe and his son, Keith, have continued to develop different Super Suckers to satisfy virtually any requirements. Super Sucker carb spacers increase torque, horsepower, and throttle response. This is achieved because they increase the airflow through the carburetor by creating a smooth transition from the barrels of the carburetor to the mounting flange on the intake manifold. Our plastic Super Sucker carb spacers are intended for drag race use only. The aluminum spacers are intended for street-strip, circle track, boats, road race, and other off-road application. 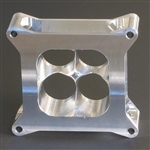 HVH SS4150-1AL-LTW Super Sucker Carburetor Spacer, Lightweight 1"
Lightweight 1 inch aluminum carburetor spacer for 4150 series carburetor running circle track or street strip applications. HVH SS4150-2AL-LTW Super Sucker Carburetor Spacer, Lightweight 2"